Hi ! children, here is an interesting story from the collection of Panchatantra. This story is about a talkative tortoise and the sad death of tortoise due to its forgetfulness and due to too much of talking nature. Long long ago, there lived two geese near a lake. There lived a tortoise in the same lake. The two geese made friendship with the tortoise and in no time all the three became very close friends. The geese enjoyed swimming in the lake and eating food from the lake. While the tortoise too enjoyed its stay in the lake. The tortoise happened to be too talkative and keeps talking too much to its friends. Unfortunately there were no rains for few years and there was a drought situation. The water levels in the lake started decreasing and it started drying up. This made the geese and the tortoise to think about moving to another lake which is full of water. The two geese went in search of a lake which was full of water and when they found one, they decided to move to the new lake. The tortoise too wanted to move to the new lake but he found it too difficult as he could neither fly like the two geese nor could he walk such a long distance. The tortoise felt sad and disappointed. The two geese did not want their friend to be unhappy, so they wanted to help the tortoise in moving to the new lake. They thought of a plan and then brought a long stick. According to their plan, the two geese would hold the stick each one with their legs on each end while the tortoise had to hold the stick with his mouth in the middle. Thus, the two geese can fly to the new lake carrying the tortoise. "Listen carefully dear friend", said the two geese. Do not open your mouth while we fly. Remember that if you open your mouth and talk while we are flying, you will fall from a great height and will meet with your death. So, be careful, dear friend. The tortoise was very talkative by nature yet it said, "Sure, I will keep my mouth shut while we fly". According to their plan, all the three friends were ready for their flight. Ready 1, 2, 3 start and thus all the three flew up and up. This was the first flight for the tortoise who started enjoying the aerial view of the ground below. While they were flying, they had to cross a small village. The people of the village starting looking up at this strange sight of two geese carrying a tortoise. This was an unusual sight for the villagers, so they started discussing about this strange sight and they started laughing, clapping their hands and shouting loudly. Now the talkative tortoise who are observing the commotion of the villagers and got anxious to know why the villagers are shouting and clapping their hands. 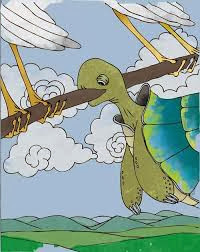 As the tortoise was talkative by nature, he forgot the caution of not opening his mouth while flying. He wanted to ask the villagers why there is such a commotion. The two geese guessed about the curiosity of the tortoise and were cautioning him, "oh! no, do not care for the villagers looks and just hold the stick tightly with your mouth. But it was already as the tortoise became impatient out of curiosity and already opened his mouth. THUD! the tortoise had a great fall from a great height. Alas!, the poor tortoise had to meet his death due to his talkative nature. So children what do we have to learn from this tragic story? Moral: Always be attentive at all situations and do not forget the good advises.